Nowadays, with more and more globalized companies, working remotely through different time zones, through different continents and engaging customer from different locations around the world, conference calls and online presentations have become two undeniable tools in the belt of every professional. PowerPoint Presentations are an amazing tool to help communicate clear messages through remote conversations visually assisted. Today, PowerPoint presentations are not only created to follow an agenda, but to clarify concepts that can be misunderstood across the distance of a conference call. Remote presentations are becoming more and more popular not only for corporate presentations but also for sales, marketing, online education and tutoring. Presenters have a wide set of helper tools to improve the remote presentations experience, and generate the experience of real life presentations. Some of those tools include video conference tools, desktop sharing software and video recorded presentations. All of them are incredible tools and have been improving over the years. But reality is always harder when talking of business. At SlideModel.com we receive serveral request from our business customers to help them improve their remote presentation experience without the overhead of addional tooling. In most of the cases, additional tools require the installation of software or plugins that slow down the presentation startup, awaiting for every guest to be able to see the presentations, while consuming the time scheduled for the meeting.The increase of multi device across business is challenging the decision of the tools to use, and is very difficult to predict before the meetings starts. 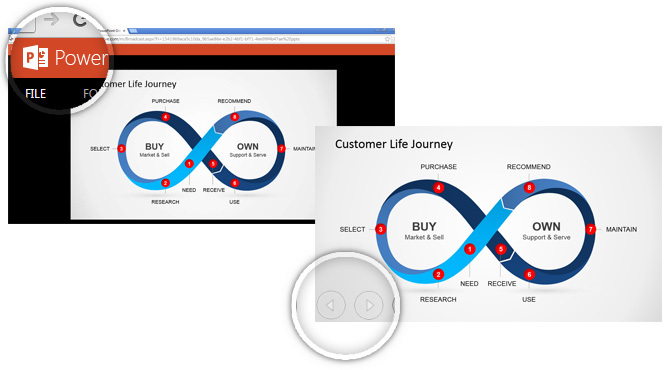 One of Microsoft’s PowerPoint gems is the ability to broadcast your presentation through the web, in real time , and for free (for an audience less than 50 guests), with little effort and with the only requirement of owning a Microsoft Live Id. This tool is the Slide Show Broadcast, and can be triggered directly from PowerPoint (versions 2010 onwards). Every PowerPoint feature is supported (animations, transitions, etc), It allows your guests to follow your presentation from any internet location, just sharing a URL. No additional software is required. Almost all versions of major internet browsers are supported, bandwidth consumption is really optimized and the most important is that your audience is ready to follow your presentation on a click. Always read Service Agreement of any software service you consume. Your data is an assets that needs to be guarded as gold. Make sure you, your company and the target audience are comfortable with Microsofts Services Agreement. In this step you will be able to select if the presentation will be available for download to the audience. Make sure you always verify that this option complies with your need. By default the checkbox is unchecked. Login to a private Sharepoint Online Services hosted by your company or service provider. 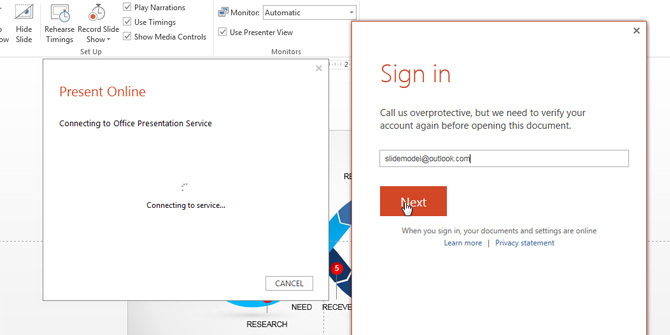 For the sake of the example, we will continue with Microsoft free Present Online service through our Microsoft Live ID. 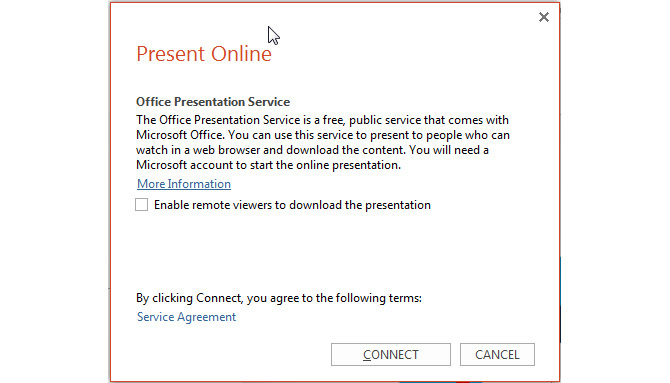 After you Login to the services, Microsoft Presentation Services will upload your presentation to the cloud, and will give you an URL so users can start viewing while you present. Share this URL with your audience so they can connect to the slideshow. Note that this url can be accessed through every device and does not require the installation of any software product or browser plugin. The presentation will not start until you click in the “Start Presentation” Button. The Guest start visualizing the presentation in the browser. This presentation is synced with the presenter actions, so if the presenter moves forward, the guest will perceive this action remotely. You can end your presentation any time, pause it and restart it. The functionalities are almost the same as the real life presentations. 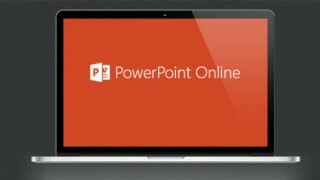 If you leave PowerPoint, the presentation ends by itself, so there is no risk of sharing something unwanted. Also, you can continue using other windows without the need of changing any sharing options, as your desktop and applications are isolated from the presentation. Number of Users Accepted: Until the date of our tests , the Microsoft Present Online Services only supported up to 50 guests (when using the free service). This is almost enough for 99% of remote presentations today, and there are almost nos solutions that really surpass this limitation, but it can be a decision making feature for tutoring, E-learning or webinars. The lack of control over the audience that can access the presentation. 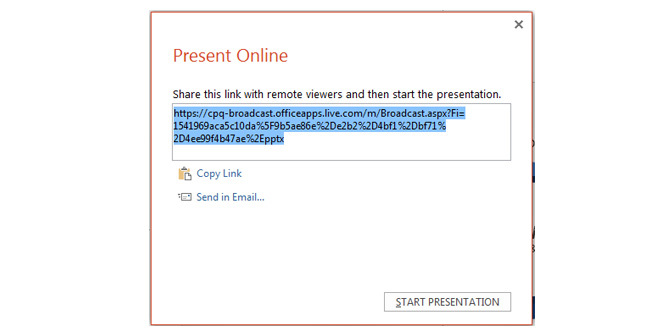 If any of the guests invited, shares the URL of the presentation with and external guest, the presenter will not be able to control who can view the presentation. So be sure you share the URL with the appropriate audience, and make sure you close the presentation when you’re done. We expect that you can give a chance to Microsoft PowerPoint Presentation Services, and try by yourself this amazing tool. We have been using it for webinars and demo sessions and our experience (and our audiences feedback) has been more than satisfactory.